Walter Röhrl was carving up the circuit in the Porsche 911 Turbo S like a skilled Jedi Master – and I was sitting next to him, mesmerized by the breathtaking show. I had strapped myself securely into the front passenger bucket of the all-new coupe less than a minute earlier, expecting nothing more than a few quick laps around a track at the hands of another celebrated race driver. Been there, done that. Many times, actually. Yet this was different. Röhrl was not only calculated and methodical in his approach, but his rally-tuned cerebrum appeared to be actively reading available grip levels while he was effortlessly tossing the all-wheel-drive Porsche into each corner at gut-wrenching speeds. His hands were moving rapidly, sending tiny steering corrections to the front tires, and he was using every inch of the track to extract more speed. We launched over a curb, dropped a wheel in the dirt and then drifted around a wide off-camber turn. His human precision and focus was astounding, and the performance he was extracting from the machine was just short of breathtaking. 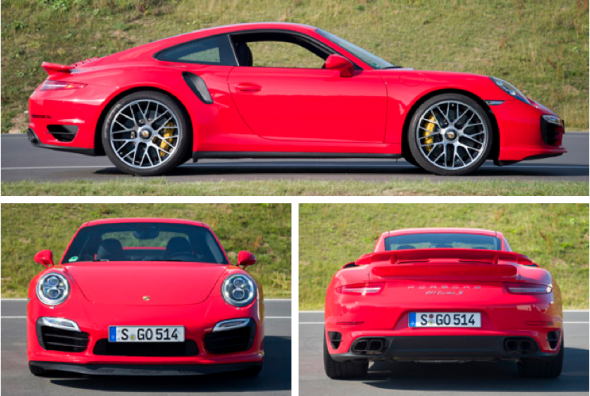 Few drivers are as gifted as Walter Röhrl – and few vehicles are as capable as the new Porsche 911 Turbo. Automotive history was made when Porsche launched its first Turbo model in 1973, showing a prototype of the new car at the Frankfurt Motor Show. Unlike its naturally aspirated 911 siblings, the silver coupe on display was equipped with a 3.0-liter flat six-cylinder engine breathing pressurized air courtesy of a single turbocharger. At the time, few realized how significantly forced induction would change the game. This rear-mounted engine was rated at 260 horsepower, giving the coupe a top speed of 155 miles per hour. The performance was excessive for a street car of the era, but Porsche had an ulterior motive; it was building the required 400 units to meet GT motorsport homologation rules. Yet the automaker greatly underestimated the popularity of its new street-legal race car. In response to demand, the company doubled – and then tripled – production. By 1977, Porsche had sold 2,876 copies of the Type 930 Turbo 3.0, and its enthusiast customer base was begging for more. The German automaker didn’t hold back. 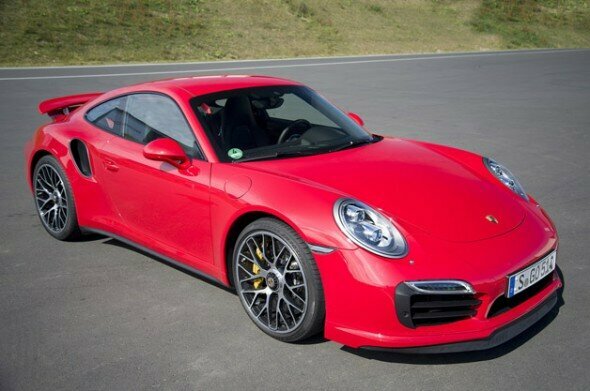 More than four decades after its initial debut, Porsche has introduced its eighth-generation Turbo for the 2014 model year. The new coupe, built on the Type 991 platform that was launched just last year, leapfrogs its predecessor in nearly every category – pushing the envelope has always been a Turbo tradition. Even though the outgoing Type 997 Turbo remains a formidable street car, Porsche engineers knew they could raise the bar with the all-new Type 991, as its platform is vastly superior. In addition to the fresh chassis with an aluminum-steel composite construction that is stiffer and 13-percent lighter than its predecessor, the new Turbo models feature a slew of significant upgrades above and beyond the already capable Carrera and Carrera S. These include all-wheel steering, adaptive aerodynamics, a redesigned all-wheel-drive system and a more powerful engine. The flagship Turbo S model pushes the envelope even further, with standard active Dynamic Chassis Control (PDCC), ceramic brakes (PCCB), wider forged wheels, LED headlights and unique badging. The transformation from standard Carrera to Turbo involves more than the addition of two Variable Turbine Geometry (VTG) turbochargers. It is an exhaustive process that affects nearly every mechanical aspect of the vehicle, and most of the enhancements remain buried beneath the car’s new bodywork. Speaking of physical appearance, in the late ’70s and early ’80s, passers-by had no problem distinguishing the early 930 Turbo from its lesser brethren – its wildly flared rear quarters and distinctive “whale tail” spoiler were a dead giveaway from a quarter mile down the road. While many lament that this aggressive styling had been lost with more recent models, Porsche is reversing the trend with this latest iteration. The new Turbo models are substantially wider than even the fat-bodied Carrera 4 models (by a full 1.1 inches), and their rear flanks feature a level surface “of more than a hand width” on each side to drive the point home. Seen from a distance, especially from the rear, the new fender sculpturing is aggressive and purposeful. Buried deep within those wide fenders, and really only visible from below, is a twin-turbocharged 3.8-liter flat-six engine. The direct-injection powerplant features VarioCam Plus (variable valve timing and lift) and Variable Turbine Geometry (VTG) to develop 520 hp and 487 pound-feet of torque in standard configuration (selecting the optional Sport Chrono package boosts torque to 524 pound-feet). The range-topping Turbo S, which we drove for this piece, is boosted to 1.2 bar of intake pressure, and it boasts a 200-rpm higher redline allowing it to develop 560 horsepower and 516 pound-feet of torque (bumped up to 553 pound-feet with the optional Sport Plus package). 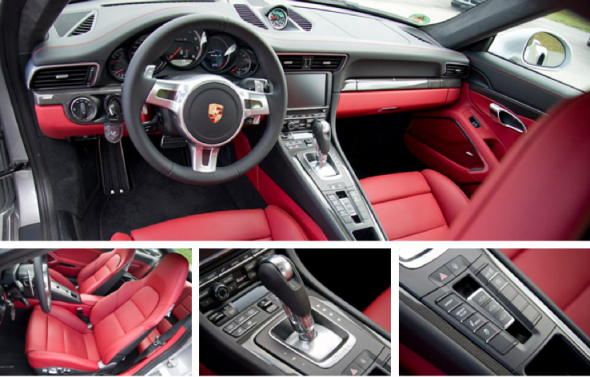 As it did with the GT3, Porsche has dropped the six-speed manual transmission option with the 991 Turbo and Turbo S. This leaves the automaker’s excellent seven-speed Doppelkupplung (PDK) automated dual-clutch gearbox as the sole transmission. Refined and updated, PDK has been designed with “virtual gears” that allow both oil-bath clutches to slip and provide gear ratios between the fixed sets (Porsche says it is wear-free). Power is sent to all four wheels through an electronically controlled Multi-Plate Clutch (PTM), and an electronic rear differential lock and Porsche Torque Vectoring (PTV+) are standard. A MacPherson-type independent suspension is used up front, while a five-link independent setup is tasked with the role in the rear. Coilover shocks are standard at all corners, each working in conjunction with adaptive Porsche Active Suspension Management (PASM), which offers two driver-selectable programs. Electromechanical power steering is employed on both Turbo and Turbo S models. The standard Turbo model is fitted with six-piston monobloc aluminum brake calipers over drilled and ventilated iron rotors up front and a similar four-piston monobloc setup in the rear, while its brake package is hidden within 20-inch wheels wearing staggered 245/35ZR20 and 305/30ZR20 tires. The Turbo S models are upgraded with a Porsche Ceramic Composite Brake (PCCB) package as standard equipment, with six- and four-piston monobloc aluminum calipers. 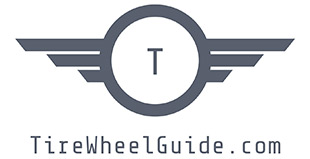 The wheels are slightly wider (by half an inch), with center-locking hubs in place of conventional wheel bolts, though tire sizes are identical on both models. As mentioned, the new Turbo models are equipped with active rear axle steering. The electro-mechanical system, shared with the track-ready GT3, places a servo at each rear wheel that is tasked with steering the hub in the same (up to 1.5 degrees) or opposite (up to 2.8 degrees) direction as the front wheels based on vehicle speed and steering wheel angle. Porsche points out that active steering virtually reduces the wheelbase in tight corners and increases it at high speeds, improving both turn-in and stability. Adaptive aerodynamics are not new to Porsche (its Type 964 models were fitted with an active rear wing in 1989), but the pneumatic system employed on the new Turbo models is. Sports cars need low front splitters to optimize airflow, but it often comes at the cost of damage when entering steep driveways. While many of today’s high-end vehicles (including the GT3) have resorted to a nose lift system that raises low front ends over daily obstructions, Porsche has devised a soft rubber front splitter that extends and retracts with air pressure. In its stored position, it tucks out of the way, allowing the nose of the Turbo models to clear most obstructions. But as speeds increase, or under manual control via a cockpit-mounted switch, the three-position front airdam deploys in stages. Working in conjunction with an active rear spoiler, Porsche Active Aerodynamics (PAA) takes the worry out of city driving while increasing downforce and reducing drag at high speeds. It is impossible to explore the limits of the new Turbo models on public roads in the United States, so Porsche invited us to its German homeland to wring out this latest offering. After a long day’s worth of travel and a restless night’s sleep, I grabbed the keys to an Amaranth Red metallic Turbo S and pointed its nose towards the Bilster Berg Drive Resort just a few miles away. 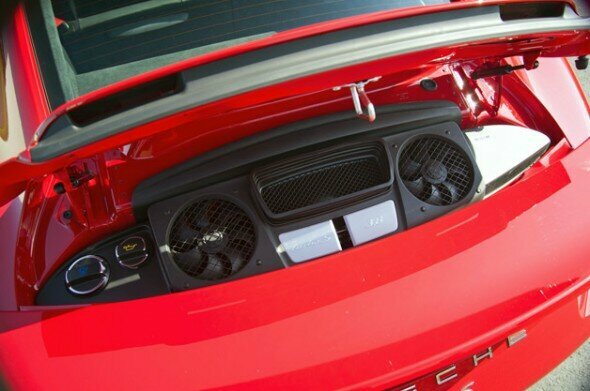 The easiest way to tell these new forced-induction models apart from their naturally aspirated siblings (Carrera, Carrera S and GT3) is to look for the additional openings, each engineered to feed and exhaust air to the intercoolers and brakes. While the intake on the front fascia is slightly larger than on standard 911s, the most visible changes are found on the rear quarter panels where Porsche has located intakes on the leading edge and exhaust vents just aft of each wheel. The rear of the Turbo models are also distinguished by their quad exhaust tips with square outlets. But things are a bit more complicated between the two turbo models. 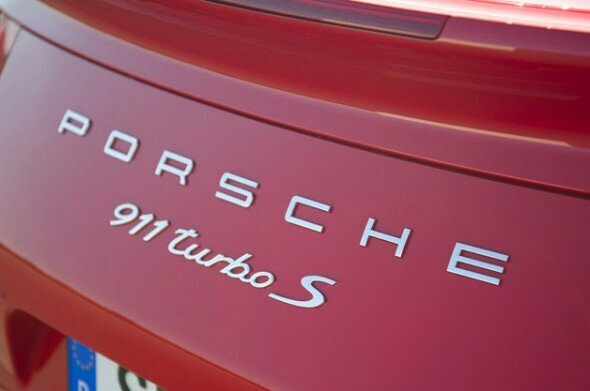 Short of a glance at the “S” on the rear decklid badge, it is nearly impossible to differentiate the standard 911 Turbo (base price $149,250) from the 911 Turbo S ($182,050). This is because customers may option-up a standard Turbo to make the two appear nearly identical from a distance of ten yards. Inside the cabin is a similar story, as both well-configured, leather-lined coupes share just about everything in common except for the model scripting on the tachometer and multi-function display start page. Of course, there is also that slight difference in performance. Porsche conservatively says the 3,516-pound Turbo Coupe will hit 62 mph in 3.2 seconds with the Sport Chrono package, while the slightly heavier 3,538-pound Turbo S Coupe can do the same sprint in 3.1 seconds. 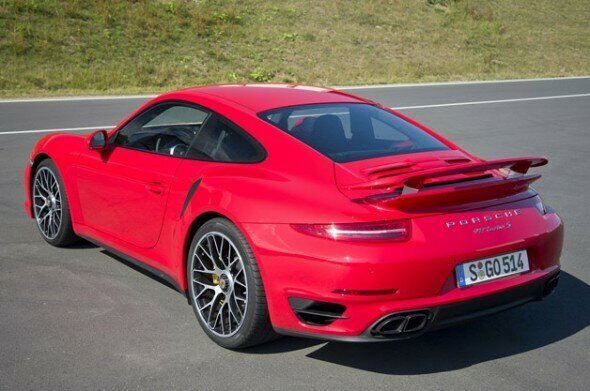 The Turbo is electronically limited to 196 mph, while the Turbo S is capped at 198 mph. A smiling engineer told me that it will run unrestricted to about 210 mph, but they held it back due to tire limitations. The brand-new, 2.67-mile Bilster Berg Drive Resort is absolutely spectacular. Designed by Hermann Tilke (the brains behind the most recent Formula One circuits at Abu Dhabi, Bahrain, Shanghai and Istanbul) and with Walter Röhrl on board as a technical consultant, the challenging club circuit follows the German topography over the site of an old British ammo dump. The 30-foot wide track is perfectly paved with technical corners, fast straights and a wicked 26-percent drop that makes the Corkscrew at Mazda Raceway Laguna Seca appear outright tame. In other words, it’s just about perfect for the new Turbo. On this pristine track, the 911 Turbo S is nothing short of a beast – a surprisingly obedient one. 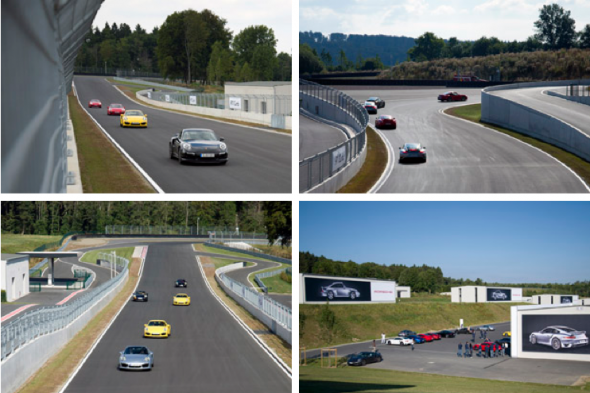 I spent the first couple laps familiarizing myself with the Porsche and the circuit. The Turbo S coupe isn’t on the lightweight side of the scale, but it drives much leaner than its curb weight suggested. Initial turn-in is quick, with almost magical precision thanks to that all-wheel steering, and there is almost zero perceptible body roll. The brakes are very strong, with a pedal that is easy to modulate. Outward visibility, always a 911 strength, remains excellent. It doesn’t take long to realize that its performance envelope is extraordinarily impressive for a licensed street car, and before long, I was pushing the car much harder than I would have expected that early in the day – a real testament to how easy it is to drive at blistering speeds. It doesn’t take long before the car is urging you to dive fast into the corners, trust the stopping power of its carbon-ceramics brakes and blindly put faith in its all-wheel-drive system by getting all the way on the accelerator very early upon exiting each corner. The Turbo S is stupid fast, and its smorgasbord of electronic nannies is ready and willing to work its tail off to make the person behind the wheel look damn good. At Porsche’s request, I tackled the circuit in Sport Plus mode. This puts all adjustable systems (steering, throttle, suspension, gearbox, stability control, etc.) in their most aggressive settings and encourages the exhaust to pop, cackle and burble under deceleration. Leaving PDK in Drive, the gearbox cracks off both up- and down-shifts with blistering quickness while brilliantly holding the proper gears through each of the corners and executing rev-match downshifts under hard braking. It’s a flawless copilot – never once would I question its automated logic. After a half-dozen laps, I began to scare myself. My speed between the corners was increasing, and I found myself overcooking sections of the track (very easy to do with 560 hp under your right foot). Yet the Turbo still didn’t bite. Instead of spinning wildly into the barriers, this 911’s four-wheel steering, torque vectoring and active suspension obeyed my steering inputs, wiggled a bit, and then blasted me off each subsequent apex. My heart was racing and my knuckles were white, but I was having one helluva good time in this street car. Immediately after lunch, I grabbed the same car and headed out across the German countryside to experiment with the different driving modes: Standard, Sport and Sport Plus. I tinkered with the console-mounted buttons only to decide that that Sport is ideal, as it provides slightly more aggressive shift logic, more bark to the exhaust and a firm, yet comfortable ride. In this configuration, the Turbo had a new demeanor. The PDK shifts as smoothly as a torque-converter automatic, without even the slightest mechanical noise, and the suspension loses its harsh edge. The four-wheel steering, an invisible partner on the track, is actually more evident around town as it reduces the coupe’s turning circle to that of a compact car (just 34.8 feet). One hour earlier, the Turbo had been violently careening across a racing circuit, yet under these circumstances, it comfortably crawled across cobblestones and avoided pedestrians in a centuries-old German town at a walking pace. Driving at this relaxed state, I took a few minutes to search for blemishes – not easy with a vehicle that has been refined seven times over three decades with cost hardly a concern. First, road noise (always a 911 issue) is still prevalent inside the cabin. Second, the Turbo’s fuel economy when the engine is spooled up is dismal (out of boost, expect mid-20s on the highway). Lastly, the rear seats are best left for secondary luggage. I’ll confess that my primary objective for the afternoon was to find a nice stretch of autobahn and stretch this Turbo’s legs. To my delight, the opportunity presented itself shortly thereafter. Cars like this 911 Turbo S are viewed as kings on the unlimited-speed motorway, and it’s great fun watching everything move out of its way. But afternoon congestion and proper autobahn etiquette kept most of my burst speeds to about 120 mph. I was fortunate enough to get one quick blast to a maximum of 152 mph before a diesel-powered Audi A6 Avant plugged up the lane. The Porsche was not fazed by the vigorous autobahn exercise, but I wanted more time on the circuit. It was back at the track when I handed the keys to Walter Röhrl for a few hot laps… and that same Turbo S was forced to run at twelve-tenths without breaking a sweat. Like each of its seven predecessors, the new Turbo sets a new segment benchmark for overall drivability. And even though some may discount its engineering black magic and lack of an available manual transmission, it remains a driver’s car of the first order. It intentionally lacks the rawness and engagement of Porsche’s own GT3 (still lighter and quicker around a race circuit), but it more than makes up for this deficiency with impressive and all-encompassing capabilities. Owners may load the Turbo’s front trunk with luggage and rapidly drive it across an expansive continent, unchallenged by any road or weather condition, and arrive at the destination completely rested. 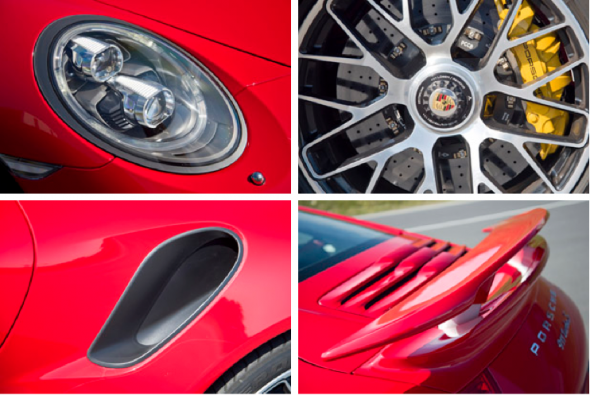 That versatility is what truly sets the new 911 Turbo and Turbo S apart from its competitors. It is a no-compromise daily driver, podium-winning club day racer and a buttoned-up luxury car for every black tie dinner. Lacking any known challenger of equal all-around accomplishment, I’d argue that Porsche’s new 911 Turbo is the world’s most talented street car. This entry was posted on Thursday, September 5th, 2013 at 6:50 am. It is filed under Featured Posts. You can follow any responses to this entry through the RSS 2.0 feed.